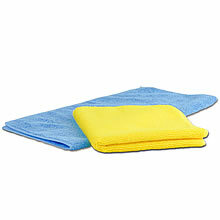 This Simplee Cleen Microfiber Towel is perfect for scrubbing and polishing jobs around the house, shop, office or garage. One of our finest Microfiber towels made from a nice tight weave allowing for maximum strength and durability. This is ideal for polishing metals, stainless steel, autos, bikes, stubborn stains and any hard to clean surfaces. Any surface that requires a super soft cloth and leaves no lint behind. • Size: 16" X 16"